Today we will discuss about Velox boiler. velox boiler is a forced circulation water tube boiler. 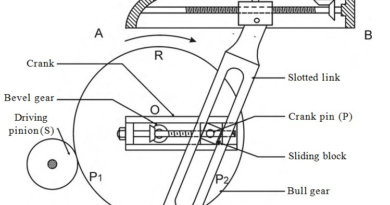 It is mostly used in gas turbine. In this boiler, the velocity of flue gases is greater than the velocity of sound, which causes more heat transfer from gas to the water, which increases the steam generation rate. Due to this, it is most important boiler. When the velocity of the gas is greater than the speed of sound, its heat transfer rate is also increases. So more heat is transfer from gas to water as compare when the heat transfer at the subsonic speed. This is the basic principle of of it. This boiler can increase the heat transfer rate or can say steam generation rate without increasing boiler size. This is why; Velox boiler is most successful boiler in the gas turbine industries. Velox boiler is a water tube forced circulation boiler. It has a gas turbine driven air compressor, which compresses the air. This compressed air enters into the vertical combustion chamber, as result, high rate of heat release from the fuel, which increases the flue gases velocity up to the sound velocity. This is a force circulation boiler, so pump is used to circulate water inside the boiler. This boiler also consist water and fire tube to maintain the flow of gas and water inside the boiler. This boiler also consists other necessary mounting and accessories like economizer, super heater, blow off valve, safety valve etc. 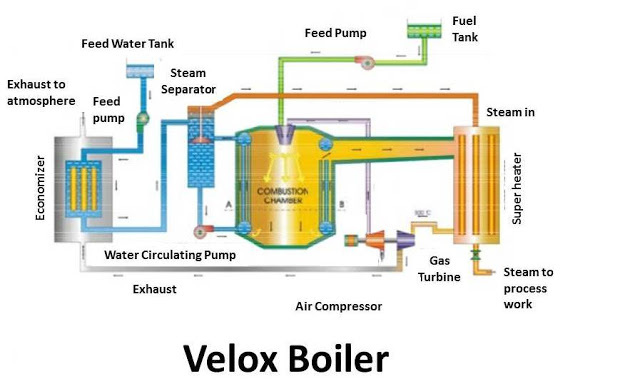 The Velox boiler works as a basic heat exchanger. The working of this boiler is as follow. The air is compressed by air compressor driven by gas a turbine driven. This compressed air passes from the combustion chamber, where more heat release by the fuel which increase the velocity of the flue gases up to sound velocity. From the bottom of combustion chamber, this flue gases pass from the fire tubes. These fire tubes surrounded by the evaporator water tubes. The water from the economizer passes from the evaporator tube force by a circulating pump. This water passes 15 – 20 time from the evaporator tube at very high speed. Due to this high speed circulation, heat is transfer from the gases to the water at very high rate. The mixture of water and steam is formed which further passes from the water and steam separator. The steam from the steam separator passes to the super heater and further for process work. The remaining water in the steam separator again passes from the evaporator tube. The flue gases from the fire tubes send to the super heater tubes, where it increases the steam temperature. The gas from the super heater sends to the turbine where it rotates the gas turbine and then passes from the economizer. This is the working of Velox boiler. 1. This boiler has high heat transfer rate. 2. It has great flexibility. 3. it is compact in design. 4. It is easy to control. It is fully automatic. 5. It has great thermal efficiency of about 90 – 95%. Today we have discussed about Velox boiler. If you have any query regarding this boiler, ask by commenting below. If you like this article, don’t forget to share it on social networks. Subscribe our website for more informative articles. Thanks for reading it. What is stem generation rate of this boiler? Which pressure and temperature we can get? This is vary useful information. Thanks.